The Power of Now (New World Library, 1999) by Eckhart Tolle has become a word of mouth best-seller for one simple reason: it has the power to change people’s lives. Tolle, once a research scholar and supervisor at Cambridge University , describes in his book his own spiritual transformation leading to his path toward finding peace along with a new direction in life. His thesis is not connected with any doctrine. Tolle simply shows readers how to see themselves as the creators of their own pain. Moreover, he explains what needs to be done in order to find peace and lead a pain-free existence by finding one’s own true self, while blocking out the challenging demands of the mind — essentially, learning to live in the Now. The Power of Now is for anyone of us wanting the opportunity to change his or her life by allowing themselves to pull away from the barrage of questionable concerns that haunt our daily routines and in turn, hold us back. It is for anyone who wants to find their true self — the inner being that is nourished by peace in order to embrace and celebrate one’s own existence on this planet as an integral part of the cosmos. 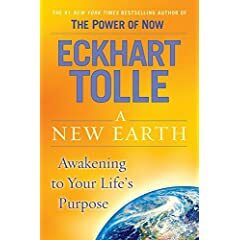 Oprah Winfrey’s New Book Club Pick, A New Earth: Awakening To Your Life’s Purpose by Eckhart Tolle!